Reading Wine Sleuth’s thoughtful post regarding the lack of BYOB in London got me wondering how many of the restaurants I frequent (or am considering visiting) actually allow patrons to bring their own wine. The BYO lists available online (wine pages, squaremeal and london eating) didn’t cover the places I had in mind, so I went about doing a little research of my own. As expected many top tier restaurants do not offer corkage, with reasons ranging from their wine programmes being designed specifically to match their food (fair), to being only licensed to serve wines from their own wine list. I particularly liked the response from Restaurant Gordon Ramsay that amusingly suggested bringing our own wine could “introduce food safety risks to the restaurant which could contaminate our (their) own foods, potentially putting our (their) customers at risk of infection with food borne illnesses”. However I was pleasantly surprised to find that a fair few places actually do allow guests to bring their own wine, albeit sometimes begrudgingly and generally always at a cost. Most have a fixed corkage fee (some based on their house wine pricing, like Bentley’s, Terroirs and Asia de Cuba), but a handful have certain stipulations on their corkage policies. For example, corkage fees may vary depending on the producer and vintage of the wine, number of bottles, and the day and time you wish to dine. A few eateries I checked with do not encourage customers to bring bottles per se, but noted it to be at the manager/sommelier’s discretion so it’s always worth asking, as they could possibly be swayed. I’ve ended up with a nice little list of places I can consider next time we have a special bottle we would like to enjoy in a restaurant setting, where the calibre of the food matches the quality of the wine. Here are my findings below (corkage fee listed is charged per bottle), if you wish to do the same*. Restaurants not accepting BYO: 1 Lombard Street, Amico Bio, Barbecoa, Bar Boulud, Barrica, Bob Bob Ricard, Caleya Ibérica, Cambio de Tercio, The Capital, Le Caprice, Casa Malevo, Cassis Bistro, Cây Tre, China Tang, Chinawhite, The Cinnamon Club, Dean St Townhouse, E&O, L’Escargot, L’Etranger, Galvin at Windows, Gaucho, Le Gavroche, The Gilbert Scott, Hélène Darroze at the Connaught, High Timber, The Ivy, J Sheekey, Kikuchi, Lutyens, Marcus Wareing, Meditteraneo, The Milroy Restaurant, Petrus, Pollen Street Social, Portobello Ristorante Pizzeria, The Providores, Red Fort, Restaurant Gordon Ramsay, Roast, Rocket, Roka, Rosa’s, Salt Yard, The Savoy Grill, Scalini, Scott’s, Sketch, Soseki, Supperclub, Sushi Tetsu, Tendido Cero, Tendido Cuatro, Tom’s Terrace, Umu, Le Vacherin, The Wolseley, Wright Brothers, Zuma. ~ by gourmettraveller on January 7, 2010. So useful – although I can’t believe how high the corkage fees are – definitely only worth it for special bottles! Thank you! £25 – £50 corkage fees? Ridiculous!!! Offering corkage and then sky high fees is totally defeating the point of BYOB. Honestly, don’t bother is my opinion.Thanks for the list, I’m bookmarking this post! I too am a big fan of BYO, a place I have been dining at recently is called Kennedy’s Fish Restaurant on Goswell Road, it’s an incredibly affordable place to eat, with excellent quality fish and chips, which are a great food match to many delicious wines, and they only charge £5 per bottle corkage! As for Vinoteca, we hope that our list offers a good range of price and style to keep people happy enough not to bring their own bottle. However, if you are coming in for a meal, and you want to bring a special bottle not on our list we would charge a £10 corkage, but please let the manager know, and if it’s really good, please let us have a taste! Thanks for stopping by Caitlin, I think that’s a great approach to take – to provide a good, extensive list that shouldn’t leave patrons wanting but at the same time understand that customers may want to bring the occasional special bottle to enjoy in a restaurant setting. Btw, have heard great things about Vinoteca and will be sure to come by soon (nearly made it there for pre-dinner drinks but ended up running late!) to sample your wine and food. Wow – thanks for this list. Most useful. How odd Terroirs rate for Champagne is? Glad to help! The corkage they charge for both wine & champagne is the price of their cheapest bottle in each category…hence the odd rate! Wow, it never crossed my mind that you could bring your own wine bottles to bistros? hmmm…I’ll definitely start asking now. Thanks for the insight! I think it’s great that London has so many BYOB restaurants. I didn’t know there were that many. Unfortunately in the Netherlands it’s still quite rare to BYOB to restaurants. Would you consider Bar 1707 at F & M as a BYO place? Bar 1707 is a wine bar rather than a restaurant so not really applicable to the list (but they do allow you to bring wine bought on the premises for a £10 corkage which I imagine is what you’re referring to). Fantastic effort in putting this list together – congratulations. I can’t help thinking the places who said no BYO because of “their wine programmes being designed specifically to match their food,” were being a little disingenuous: when I BYO in top end places I take a special bottle and always find something on the menu that will match it perfectly. A couple of points on the list: I imagine for many of these places accepting BYO is with a bit of a reluctance, so I’d always phone ahead to inform/ask if BYO is OK rather than just turning up with a bottle. Also, some who said “no” might just be putting up a smokescreen around a sensitive issue: Corrigans of Mayfair for example, has had a “no corkage” BYO August. Finally, although £25 – £50 sounds like a lot for corkage, a restaurant simply has to make enough profit to cover its total costs, the vast majority of which have nothing to do with food or wine – staff wages, rent, rates and tax bills cost an awful lot more than ingredients or bottles. For top end places to allow us to bring our own wines rather than pay their 3x or 3.5x mark-ups is a real break for the wine lover wanting to drink an expensive bottle from their cellar, and I totally accept a charge of £25. If they cannot pay their bills, then everyone loses in the long run. Anyway, now printing out the list for future reference. Thanks Tom, some very valid points – I don’t think enough diners realise that high-end establishments often make a loss on food and margins come from wine sales. Many of the restaurants I approached were indeed less than keen to discuss their corkage policies, so yes I would agree that asking ahead when considering bringing your own is imperative. According to the UK 2003 Licensing Act, a restaurant is only required to have a license to sell or supply alcohol for people to drink. The consumption of alcohol in a restaurant is not licensable. This means that a restaurant with or without a premises license to sell alcohol may let people bring their own wine against a charge for say service and glasses. Tayabbs for instance does not (to my knowledge) have a premises license for the sale of alcohol, but they may allow BYOB. So restaurants claiming they do not have the license to allow consumption of wines others than those they sell are not telling the truth. Just to reiterate what Tom C points out restaurants in (especially) London are run with certain overheads that mark-up on wines (and food) must cover. What Winesleuth above suggests that it should be mostly for free is simply totally unrealistic. I think corkage fees in any restaurant equivalent to the mark-up for cheaper wines plus a requirement to by something off the list are more than generous. Mikael, thanks for shedding light on that issue – quite a few restaurants I contacted used the lack of license for consumption excuse for their absence of BYO and I always found their responses suspect. This is a terrifically useful post. Excellent site overall by the way. We share many favourite restaurants. Thanks Andy – glad it’s of use. As for our shared favourites, you clearly have good taste! Thanks for creating this list. I shall be attempting to drink a bottle of my own wine at the Canton Arms. £12.50 seems reasonable, as it’s probably their average profit on a bottle of wine. We have tested the value for money of the corkage charge at Chez Bruce. 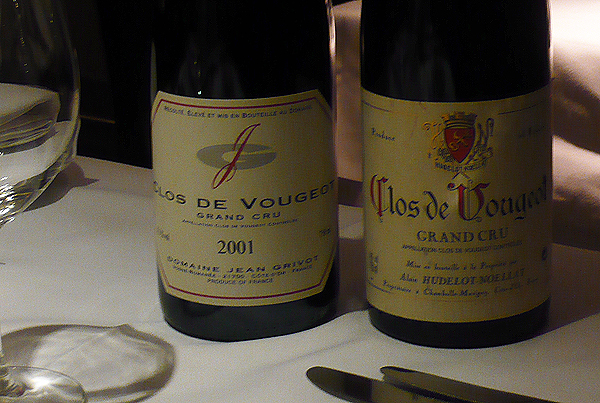 Our wines were very well looked after, carefully decanted, and served with care and flair. The same friends we went with took their own to the French Laundry, turning up a day or two beforehand to hand the wines over to allow them to settle! In addition, I brought a bottle of ’83 Chasse Spleen to Notting HIll Brasserie. I called ahead, and they charged me 20 pounds. For my money, that’s certainly worth it. The same wine would have cost multiple hundreds if it had been on the list. Also, for extreme value, consider going to Hawksmoor before 6:30 when you can get their “express meal” for 20 pounds plus BYO for an additional 5. There are usually a number of people at the Seven Dials location who have done so and are happy to share pours. I highly recommend Guanabana restaurant in Camden! Is my favourite BYOB caribbean restaurant! Food is very taste and in very reasonable prices! Check out Adiva Lebanese and Turkish BYO restaurant in Aldgate East London. Theyve got good food, decor, belly dancers the lot. Great sharing & great recommendation in comments !